Over recent years I have been witness to some entertaining sights when the cruisers have been hurtling (or not) round the marks. Boats reaching and carrying too much sail usually cause most of these spectacular events. I have been asked questions on more than one occasion on the thorny subject of reefing. Here’s my take on it for what it’s worth. I hope it’s of some help. It’s intended as a basic guide. 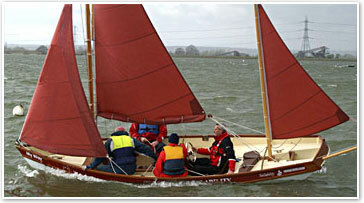 Experienced race trimmers and skippers should have it down to a fine art. This is not for them. A boat sails at maximum efficiency when it is sailing upright in the water, the underwater profile of the hull is symmetrical either side of it’s centre line. The rudder is within six degrees either side of centre. When the wind strength increases we have a corresponding increase of pressure on the sails. This causes the boat to start heeling. The underwater profile starts to change. We now have more of the hull in the water on the leeward side than on the windward side. This asymmetrical shape alters the hydrodynamic flow of water over the hull and causes the boat to try and turn up towards the wind. To counter this we must apply opposite rudder to keep sailing straight. If we don’t do anything to rectify the situation then a couple of negative effects come into play. If the rudder is extended by more than six to eight degrees beyond it’s central position, it starts to act as a brake, slowing the boat down. The keel and rudder are now at shallower depth reducing the keel’s effect to counter leeway and the rudder’s ability to keep a straight course. More rudder angle is needed to stay on course with the resultant increase in drag. It’s a vicious circle. Not quite as vicious to what could happen if nothing is done to get the boat sailing more efficiently. As a boat heels further the underwater profile gets worse. All it takes is a strong gust or even a steady increase in the wind for the hydrodynamic flow over the hull underwater to overpower the aerodynamic power of the sails. By now you will probably be applying full rudder trying to keep on course. Suddenly, you experience a sudden and violent ‘rounding up’. The rudder is useless. The boat comes up head to wind and level’s out. The boom will swing dangerously across. The sails luff noisily. You’re dead in the water. If you or the crew survived the swinging boom then your ok. It may be noisy and you could very well find yourself ‘hove to’ but you can easily get back underway, if a little chastened. The upside is, you probably only do it once! The preceding paragraphs give a few clues. If you were on the leg of a cruise with some distance to go before the waypoint, ‘old salts’ would say: “Reef when you first think about it” Of course the indicators are heeling and weather helm, (not to mention the approaching dark clouds). You shouldn’t wait till the toe rail is in the water. At night, with an ‘iffy’ forecast, reefing down is done as a matter of course. However, it is not hard and fast. There are a number of things that could be done to reduce the need to reef, particularly on short legs. It’s not my intention to go over how to reef. There are a number of variations. There are at least five methods that come to mind, depending on the boat’s rigging system. Get to know the mechanics of your reefing system backwards. One thing I will say is that when reefing at night or in difficult conditions you should always wear a lifejacket and be clipped on if you have to go on deck. If your racing around a short course and you really don’t want to sacrifice time reefing, then only to find yourself shaking it out five minutes later on the downwind leg, there are a number of things that can be done. a. Tighten the main halyard. This takes the draft (depth) forward and flattens the front of the sail. d.	If your boat has an adjustable backstay then this can also be tightened. This will flatten the upper part of the sail. Seasoned sail trimmers can do more. But the basics outlined above should do the trick till you gain more experience. What we have now is a nearly flat surface instead of an efficient aerofoil. If the steps you have taken are working, you should see less heel and pressure on the helm should ease when going to winward. If it’s still not enough then we can alter the angle at which the wind hits the sail by moving the traveller down to the leeward side. This depowers the sail even further. Finally, we could ease the mainsheet to progressively destroy any remaining lift in the sail (luffing). This should be the last resort before having to reef. It needs a strong arm and a couple of turns on the winch if you are to maintain control. Keep an eye on the angle of the deck with reference to the horizon or shoreline, this will tell you the amount to ease as she returns to a more upright position. You should be ready to reverse all these actions instantly if the wind eases off or the helm changes the point of sail. Whilst all this is going on, your headsail should be driving you forward and keeping up the speed. Remember, the aim of the exercise is to get the boat upright to take pressure off the helm and reduce leeway. If you do it right, there should be little or no loss of boat speed. Hopefully, this will get you to the mark. If you do have to reef and your boat has a masthead rig with a large headsail, then this would usually come first. With a fractional rig and smaller headsails it could mean the main is the better option to be reefed first. It’s a question of sail balance fore and aft of the mast. You don’t have to change course to reef the headsail. Boat speed can be maintained. You do need to control the furling line and the sheets. Ease the sheets to reduce the pressure until the sail luffs. Quickly wind in the furling line to take in a reef. Re-trim the leeward sheet. Make sure the sheets don’t flog and become tangled whilst the sail is luffing. If possible, a member of the crew should keep both sheets under control and separate at the clew. This is done by one crewmember on the leeward winch to ease the sheet then to control the furling line. Another crewmember takes a forward and central position in the cockpit a headsail sheet in each hand. As the reef is taken in a small amount of pressure is maintained on the sheets to stop them tangling together but not so much as to make it difficult to take the reef in. When the reef is in, the leeward sheet is handed back to the trimmer to be wound in on the winch. Should you have to reef the main there is no requirement to come up into wind. You will lose a bucketful of speed. As you slow down and point into wind the bow may pay off on the opposite side and you will be ‘hove to’ as the fleet disappears into the distance. The helm should bring her to close-hauled. Keep the headsail driving on. Ease the kicker and tighten the topping lift. Ease the mainsheet to reduce pressure on the sail; this will help to centre the traveller. Once the traveller is back into a central position ease the mainsheet some more, if needed, until the sail starts to luff. You can now reef down. The boat still has momentum so she can quickly get back on course. Remember that releasing the kicker makes tightening in the reef at the boom a lot easier. On a windy day consider putting reefs in prior to leaving the pontoon. It’s commonly accepted that shaking a reef out is easier than putting them in once your clear of the harbour. There’s no substitute for getting out on the water. The harder you practice the luckier you will get. Keep that toe rail dry!